The first three are beyond human control. For example, for mold to grow there must be mold spores. Mold spores are found anywhere and everywhere. You can’t avoid them. Also, food for mold cannot be controlled. Molds consume any organic matter, dead or alive, like cellulose (wood) and even synthetic products like paints and adhesives. And we have absolutely no control over the temperature. The one ingredient that we can control to stop mold growth is moisture. Mold and other wood-destroying fungi require moisture to grow and thrive. And buckets of water are not required. For mold, just having moist air is plenty. In fact, scientists have determined that when the relative humidity of the air is between 70% and 99% or higher, mold has enough water to grow. If the relative humidity stays above 70% for extended periods of time, mold will almost certainly grow. Unfortunately, with the wet blanket humidity found in New Jersey, especially during our hot, humid summers, reaching that 70% level takes a little effort. In the Garden State, there is no shortage of moisture and humidity, so mold growth here is common. Once excess moisture starts hovering in your crawl space, any organic material wood, like floor joists, starts to grow mold. Mold growth is a microbial infestation that lets off airborne particles, particularly when disturbed. These particles can cause numerous serious health issues, especially for the very young and very old. 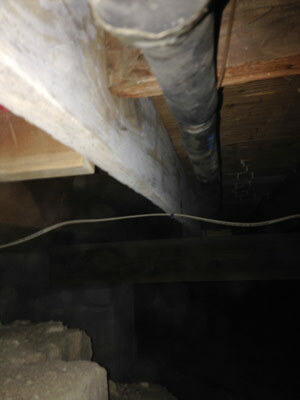 Perhaps the most important reason for maintaining a low moisture crawl space is your family’s health. Poor air quality can lead to a host of respiratory ailments. Crawl space encapsulation will restore your home’s air quality so that your family stays healthy. And the value of good health is priceless.